CONIVAL and Ben More Assynt are mountains with majesty. I read an article a long time ago about these northern giants glimpsed in the rays of the setting sun, and the quartzite stones on their summits glowing golden in the evening light. That captured my imagination. Sooner or later I had to climb them . . .
I’m camping at Badcaul on the shores of Little Loch Broom, just south of Ullapool. The campsite’s called Northern Lights but I haven’t seen any yet, despite spending several dark hours scanning the skies, accompanied by cans of McEwan’s Export. In a sort of compensatory gesture, the campsite owner – who comes from Hexham – has provided me with a detailed critique of the local chip shops. Fair’s fair. It’s a long drive from Badcaul to my starting point at Inchnadamph. But this stretch of the A835 must rank as one of the most spectacular roads in the country, with views across the Minch to the Summer Isles, and the magnificent bulk of Ben More Coigach dominating the foreground. With glimpses of Stac Pollaidh, Suilven, Canisp and Quinag, it’s at times like these you realise there is much, much more to Scotland than 3,000ft Munros. This is the far North-West Highlands, and it’s wild and wonderful. Inchnadamph is a magical name. It sounds like it should be in a poem, or perhaps one of those sentimental John Ford films starring Victor McLaglen and Maureen O’Hara. It means “Meadow of the Stags”, so I suppose that’s poetry enough. 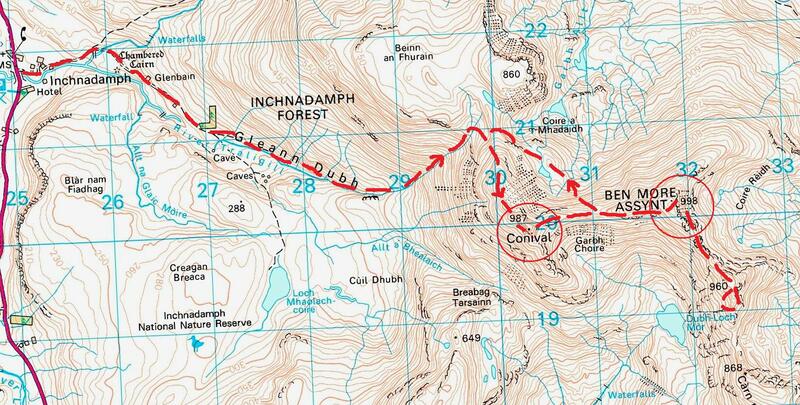 My route today is taken from The Munros: Scottish Mountaineering Club Hillwalkers’ Guide, Section 16. I follow the route along the beautiful Gleann Dubh and am soon struggling up the bealach between Beinn an Fhurain and Conival. There’s a gentle spring wind and the sun’s on my face. It’s a perfect day in a perfect world. Conival (987m, 3,238ft) comes and goes in a crunch of white quartzite. 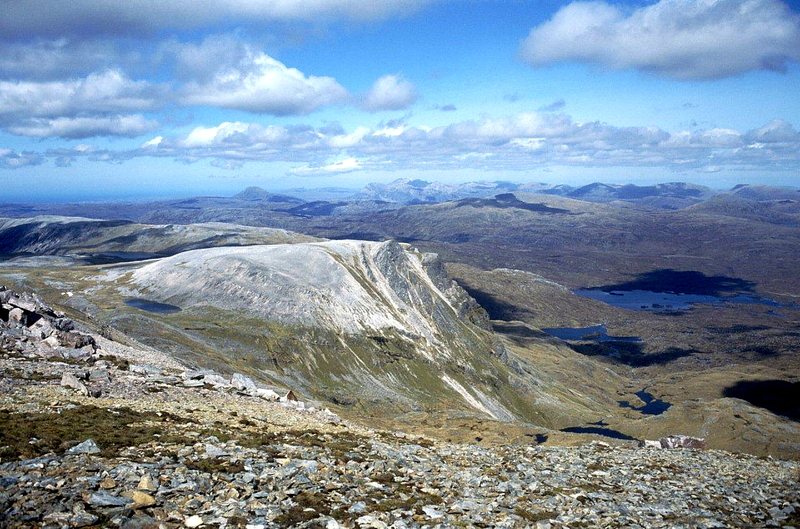 So too does its big brother, Ben More Assynt (998m, 3,274ft). But this is where things begin to go haggis-shaped, which is a shame. I pause on the crag above the loch, my toes projecting over the lip, scanning the near-vertical rock below for evidence of human activity – paths and body parts, that sort of thing. There is no evidence. I consult the guidebook again, just to confirm I’m in the right place. It turns out I am. I walk forwards and backwards along the top of the crag, searching for a route down other than launching myself into the sky like a booted Icarus. Eventually I give up and head back to the main summit. Determined to vary the homeward route, I drop down into Coire a’ Mhadaidh and spend an hour snoozing above the loch. This is a great place for a snooze. Then I rejoin my outward route at the bealach between Beinn an Fhurain and Conival and make my way in a burning afternoon sun to the pleasant hamlet of Inchnadamph. A day like this requires a suitable ending, and this is provided in the form of haddock and chips by the award-winning Seaforth Inn Fish and Chip Shop. There are few things more pleasant than sitting on a quayside, dangling your feet over the water as a golden sun sinks behind Ben More Coigach, while eating a fish supper lashed with salt and vinegar . . . and thinking: a few cans of McEwan’s and a flicker of Northern Lights will just add the final full-stop to this day. I’VE since talked to other walkers who had trouble finding a route off Ben More Assynt’s South Top to Dubh Loch Mor and gave up. Any views on this, anyone? 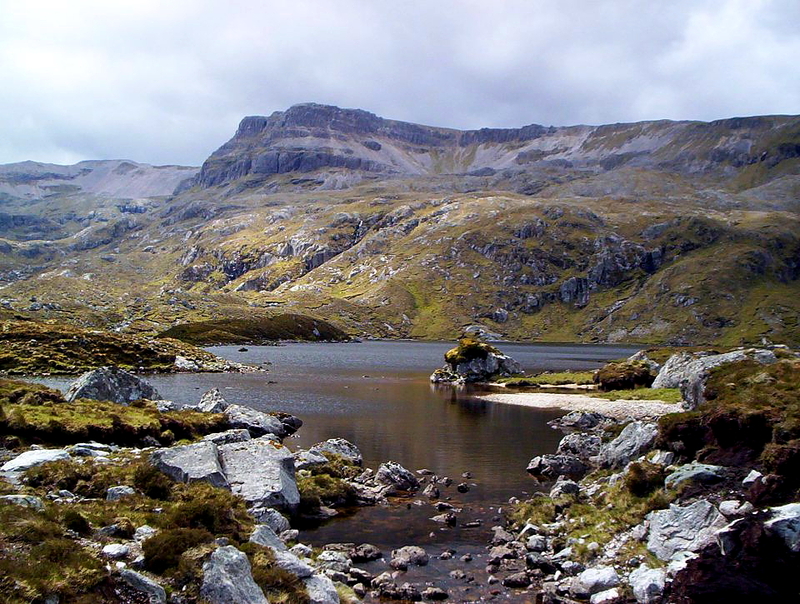 This entry was posted in Beer, Camping, Climbing, Environment, Fish and chips, Food, Hiking, Mountains, Walking, Weather and tagged Cape Wrath Trail, Munros, outdoors, Scotland, The Munros. Bookmark the permalink. Those are some of the most beautiful and spectacular photos of Scottish mountain country that I think I’ve ever seen. I need a Time Machine, to wind myself back into a state of fitness where my knees wouldn’t quit before I got halfway. Hi Martin. Thanks for that. Regarding the pictures, that’s the one time I ever used Fuji slide film and had it digitally converted by professionals at the Fuji lab. I wish they were working on that time machine. Beautiful words to go with the pics Alen. Hi Ellis. Ta for that, old mate. Tom Patey sometimes used to redefine climbing terminology so that it would be meaningful to anybody who wasn’t either Joe Brown or Chris Bonington. He reckoned that if you took steep to mean vertical, and vertical to mean overhanging, you would probably be about right. Thankfully, my climbing experience extends no further than the odd easy scramble; and only then on warm, dry rock. It sounds like you encountered some of that in the guidebook, Alen. You are absolutely correct. “Airy ridge” to me means something to stroll along while whistling lustily, but in guidebook parlance it’s something to cling to by your fingernails. One phrase I came to terms with abruptly on a ridge in the Mamores, above Glen Nevis, was “the more nervous walker might appreciate the security of a rope”. A fire tender with ladder and crew would have been better. What these writers need is a good sub-editor, and it just so happens that I’m available. The only guide book I’ve come across which doesn’t underestimate the difficulties is Irvine Butterfield’s High Mountains. He explains in the introduction that most guide books are written by climbers and warns that descriptions of routes might seem far worse to normal walkers. He’s pretty accurate in his descriptions in his chapters too and helpfully tells you if an obstacle can be turned on the left or right or whether you’re just stuck with it! Hiya James. I’ve only been in that area a couple of times but it’s only a day’s drive from North Yorkshire. It’s another world. You’re just trying to worry me aren’t you as you know I have the South Top to do this year! After your description, I’m probably going to do the whole approach from the south along the long tracks (which I’m hoping to cycle) and over the rounded hill before it. 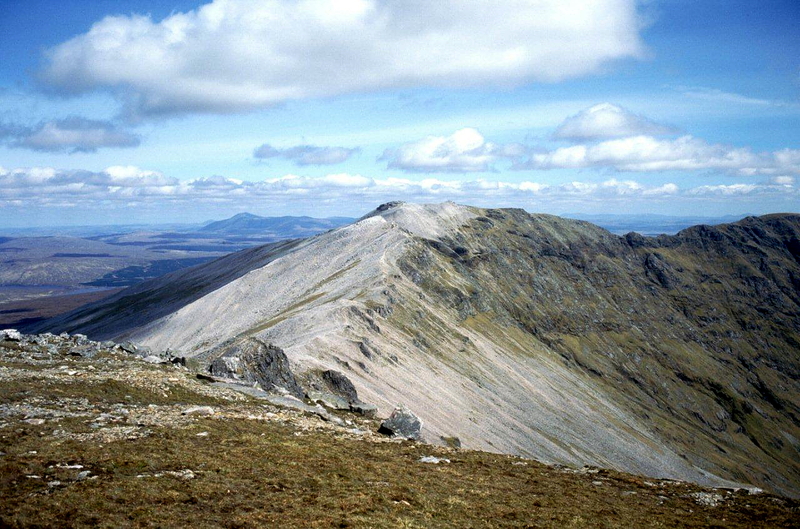 Richard is hoping to accompany me and do the ridge to the main summit of Ben More Assynt from the South Top – what was that ridge like by the way? Any photos or descriptions? The ridge is supposed to be really awful – some say like a mini Aonach Eagach..
Carol, there is absolutely nothing to worry about. 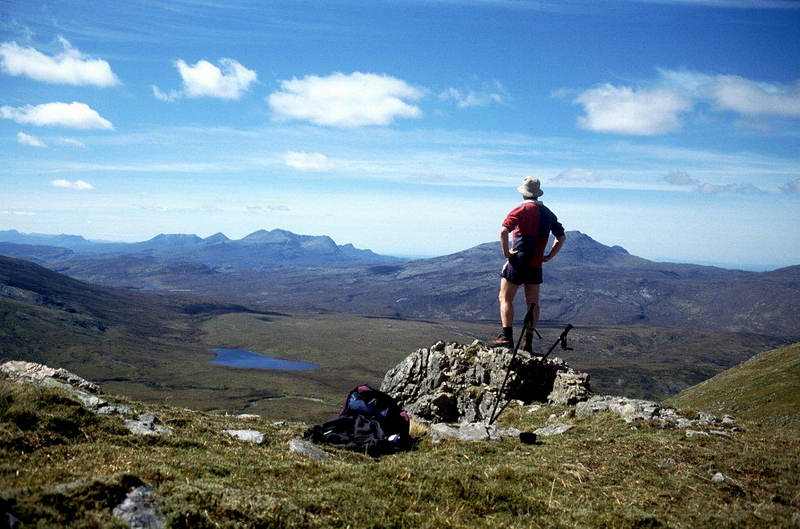 From what I recall, the route along the ridge from Ben More Assynt to its South Top is just a stroll, nothing more. 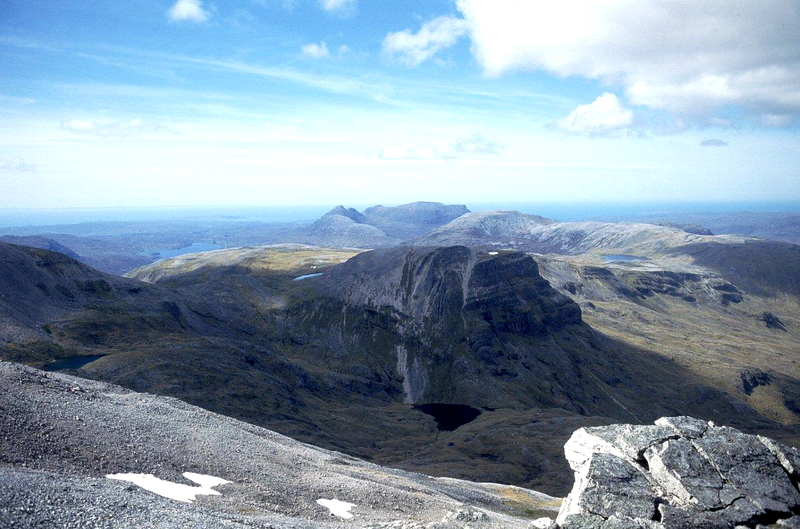 And the route I took from Inchnadamph to Conival, to Ben More Assynt is just the same – a good huff-puffing walk with nothing nasty except rough rocks crunching under your boots. You’ll enjoy every minute of it. With your mountaineering experience (which is much greater than mine), you have no concerns. Unfortunately, I have yet to witness the Northern Lights. I missed them last week when they were seen over Cumbria, but I’m glad you saw them. I even missed the eclipse here because it clouded over just before the event and then cleared just after. Blimey, that’s the story of my life. I’ve not been up that way but I’ve walked to the foot of the ridge when on the Cape Wrath Trail. I don’t think you’ll have any problems. The Oykel Bridge Hotel is handy if you’re looking for somewhere to stay. I had a very interesting night there. After all these years and ascents surely you are not still a mountain coward, carol. I’m nothing like as bad as I was but am still pretty nervy when out on my own doing pointy stuff in the west for the first time! I’ve started outdoor climbing now though – single pitch and fairly small limestone crags so I’m definitely improving! I have a soft spot for Icarus. You might have had a few soft spots if you’d continued! I find the human body isn’t designed to look down near-vertical slopes. I take the point about guidebook writers underestimating the perils of ridges and rock faces, but on the occasions I’ve stood at the start of say Swirral Edge or the summit of Causey Pike, the way down always looks like it’s somewhere underneath my feet and behind me! But from the side or the front is just a simple albeit steep slope. Someone needs to do something about perspective. Maybe invent a pair of glasses with fish eye lenses that level everything out. I think if we’re looking at inventions, Chris, I would be moving in the direction of parachutes and bat wings to combat steep slopes. Things do look steeper from the top rather than the bottom, but this particular route was off my scale. Perhaps it’s a confidence thing, because there was a time I would clamber up and down Broad Stand, on Scafell, without a care – but I’d think twice nowadays. I even tried to get down it in snow once. I think there’s a niche here for guidebook writers who don’t like heights. Or perhaps that’s already been done. Bring on the fish-eye glasses . . .
I’d love a pair of bat wings. I could use them to fight crime as well. Talking of niches for acrophobic writers, I once wondered if there was a market for fellwalking guidebooks aimed at lazy people. I suppose there’s the possibility they’d be too bone idle to buy a copy for themselves. I’m surprised there aren’t more television programmes for lazy walkers – that’s the real niche market of the future. Daytime TV is full of antiques programmes and home-buying programmes but the overwhelming majority of viewers can’t be bothered to sell their clutter or move house. I propose a series of half-hour programmes where Jeremy Kyle and Judge Rinder climb three fells per session, get passing walkers to slag each other off, then view houses for sale on the way back to their cars. I can’t think where to fit the antiques thing in but I know I’m onto a winner. Great country though – my favourite area of Scotland without a doubt. Hi Andy. Good to hear from you. No, it was the Scottish Mountaineering Club guide to the Munros. If it had been one of your books I would have been very polite and showered it with praise. I’m mulling over having a run up there in the T4 as a precursor to driving to Spain, so if I get chance I might do the walk in reverse, climbing from the loch to the South Top, just to see what I’ve missed. It all depends on events. Here is the relevant passage from my book..
angled slabs form narrow sections on the crest in places. weather the traverse is an enjoyable sporting ridge walk. That gully is bbbbblinkin steep though. I remember roundly cursing my companion who chose the route as he tippy-toed nimbly down whilst I slithered and stumbled in his wake. He was one of the best descenders in fell running though, so it was to be expected! Thanks for that, Andy. Your account has much more detail than the one I was following. In situations like that you need to be sure you’re leaping off in the right place otherwise the chances of coming a cropper are raised significantly. And Carol (comments above) will be reassured by your description of the ridge itself. Having descended by the said gully I can confirm that it is no easy option. There is scrambling involved and at the crux (pretty near the foot) one of our party wanted to climb back up to the ridge! Fortunately he was persuaded to try it and I’m happy to report that the rescue services were not called upon. Thanks for that, David. Any regrets I harboured at not having a crack at the descent have been dissipated by your wise words. Being a lone walker, I hate to think what I would have done at the bad point – if I’d found the right gulley in the first place! Thank you Alen for continued inspirational stuff. I adore this area and was aghast when I learned that a wind farm is proposed just to the south east of Ben More Assynt. Hi Alan. Thanks for that info. I don’t mind wind farms so long as they’re not in the wrong place – which this obviously is. Great story and photos, Alen. What a stunning view from the tops. I’m glad you found your way down safely. For myself, Inchnadamph has always conjured the words ‘itch’ and ‘damp’, which could be applied to some of the Scottish camping trips I’ve been on. 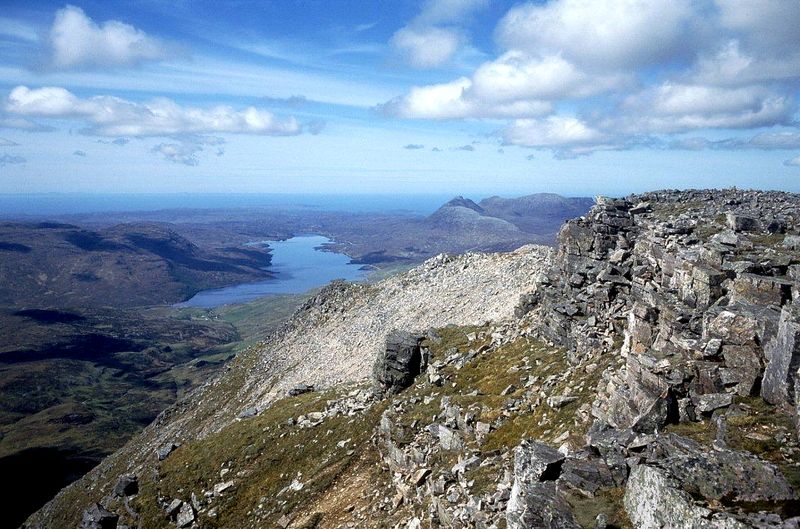 What fantastic rock formations there are in Assynt – makes me want to get up there! Hi Jo. Assynt is a beautiful area of the country, but I wish it wasn’t so far away. Still, if it was closer then I’d probably take it for granted. I Must say I’ve never associated Inchnadamph with itch and damp, but now you’ve put the thought in my head it’s probably there to stay. Your cooperation with Fuji films and their lab. was excellent. A time travel would be interesting for so many reasons. I would love to experience the Viking settlement in England. I thought you were joking when you wrote that the guide book underestimate the danger by climbing a ridge. The story is great and the pictures really are stunning. Thank you for your April Fool, Hanna. You had me scratching my head there for a minute or two. I don’t think I’ll be taking up skydiving in the near future. I could manage a straightforward parachute jump but those loop-the-loops in narrow ravines take some concentration and skill. It always makes me wonder how those guys practise things like that because you only get one chance. The same with those people who leap off mountains in flying suits and skim down to earth like flying foxes. How do you practise that? The first leap has to be perfect or you end up flat like road kill. The Norwegian mode of walking sounds very enjoyable although I don’t think I could stand the pace. One day and one night would be fine, but the following morning I think I’d roll over in my sleeping bag and take the day off. And if it’s any consolation, my late father was once flown out of Wasdale on a rescue helicopter because he slipped and knocked himself unconscious. It can happen to the most experienced of walkers at any time. If you search for Norway + skydiving + accident you’ll see that some skydivers only got to try the sport one time. I have seen a documentary about a rescue that took place in the Lysefjord. 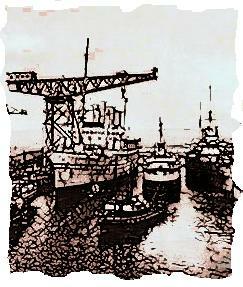 The picture from my penultimate post. The man hit a ledge on the way down. He survived to begin with. The rescue team could not help him the same day because of bad weather. The communication went wrong between rescuers and the injured. He tried to climb down from the ledge and died trying. That was terrible sad to watch but you really stick you neck out when doing that kind of sport. I’ll take a look at that, Hanna. That’s a terrible way to die. But are there any good ways? Death by golf ball is not uncommon. I’d rather die on a mountain than a putting green. 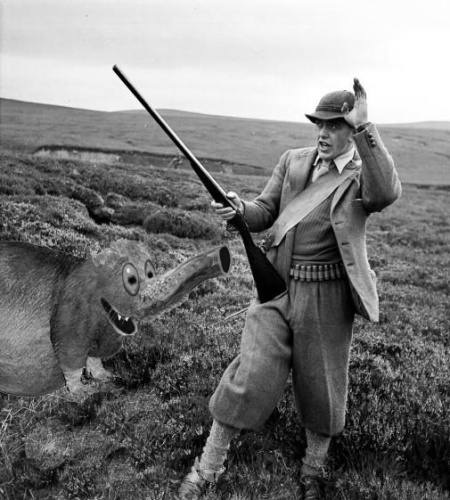 So, just what shape is a Haggis, anyway? Thanks to Glen Haggis Gold Label alcohol-free drinks. I love that area. Done a couple of trips there and done stuff on the west side. Stac polly, quinaig, canisp and the fiddlerr/ ciogach. 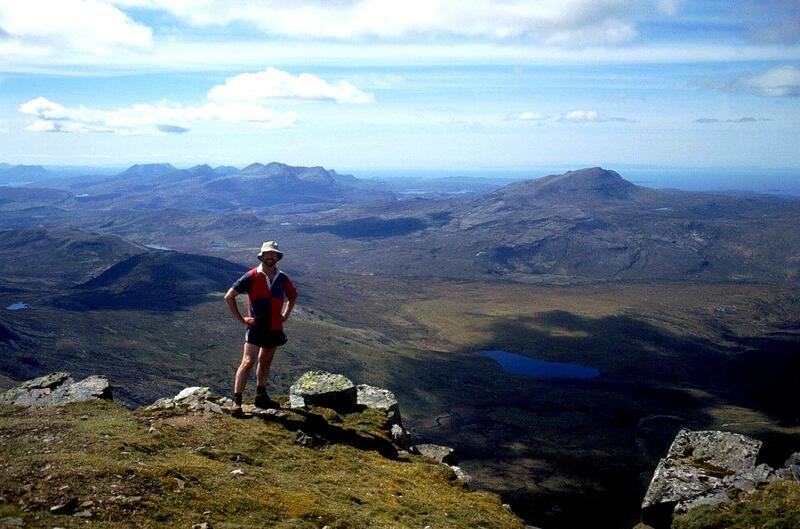 Yyuor route was on my next itinery along with an teallach. Hi Colin. I love that area too. 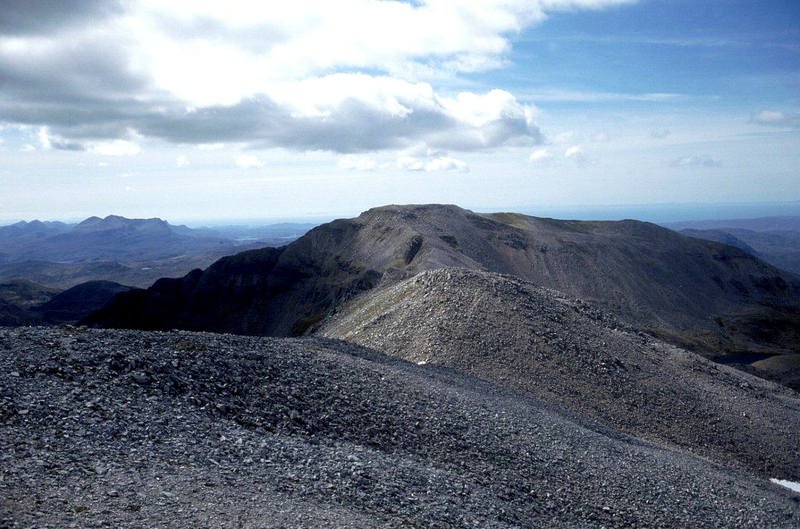 I’ve often looked at Quinaig and the others and made a mental note to climb them, but as yet have not made the effort. There are some beautiful hills in that part of the Highlands. Is it possible to STROLL up Cerro Salchicha or is it just a plain English understatement for climbing a vertical wall? Hi Hanna. I was very careful in choosing the word STROLL because the road passes close to the summit and the actual ascent is only about 300 metres vertically. I’m viewing it more as an overnight adventure than a rugged climb. There are good views of the milky way on most nights here. I’m hoping the view from the summit will bee something special.